I am sending a picture of my girl Ginseng (Ginny). Ginny will be 3 years old on November 9, 2011. I adopted her on December 29, 2010 from a breeder. She was with the breeder for the first year of her life until a breeders friend started showing her. The woman had other dogs in the home and didn't have the time to train Ginny, she was having some fear aggression and was not getting along with other dogs. She was returned to the breeder and lived the next year in a kennel. I found the ad on craigslist, went to meet her and it was love at first sight. Eight months later, obedience training, and a lot of love and hard work she is the BEST dog I could ask for. She has come so far. 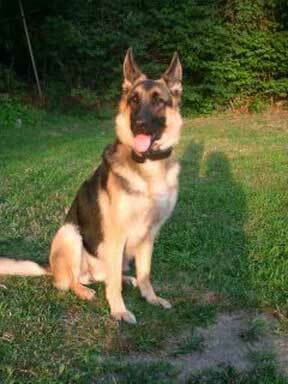 German shepherds are the most intelligent, devoted dogs anyone could ask for but they need a lot of work. I can not imagine my life without my faithful companion by my side. I have attached a picture of my Ginny girl. Everything has a reason "why" things come to be. You both came into each other's life at the right time. You can give her the Love she rightfully deserves and needs. Ginny is a beautiful, confident German Shepherd. She will protect you, it's in there blood. Take care of your girl, Ginseng, and she will take care of you! My Mia will be 2 on November 10 and we too have a heartwarming story on how we got each other, please read our stories, german-shepherd-puppy-mias-story, and mia-my-beautiful-german-shepherd-dog. She is quite the puppy dog. I hope to get to know her better and better as time goes on. Great job on the training Ri. I'm obviously not a dog trainer but it sure is awesome to see a well trained dog. I am so glad Ginny is now part of our family. A little more time and patience and I think I will be able to get a bit closer to her. She is majestic and a joy to watch. Destiny has played a part - Maria and Ginny you are meant to be..and I'm glad you have found each other. Ginny for your protection.. and You for hers.. Many happy adventures await you both.